URBANA, Ill. - United States Secretary of Agriculture Tom Vilsack will speak at the University of Illinois at 12:30 p.m. on Thursday, Sept. 10, about the role of public research universities in addressing international food security. The event, hosted by the International Food Security at Illinois (IFSI) initiative, will be held at the Alice Campbell Alumni Center, 601 South Lincoln Avenue, in Urbana. Watch the livestream here starting at 12:30 p.m. go.illinois.edu/livestream3. 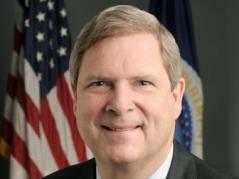 Tom Vilsack serves as the nation's 30th Secretary of Agriculture. As leader of the U.S. Department of Agriculture (USDA), Vilsack’s mission is to help strengthen the American agricultural economy, build vibrant rural communities, and create new markets for rural America. Prior to his appointment, Vilsack served two terms as the governor of Iowa, in the Iowa State Senate, and as the mayor of Mt. Pleasant, Iowa. The event is free and open to the public. Due to space limitations, registration is requested. To attend, visit http://go.illinois.edu/Vilsack. A reception will follow. Vilsack’s talk is part of the IFSI lecture series. IFSI is a campus-wide program, housed in the College of Agricultural, Consumer and Environmental Sciences, that focuses the expertise and resources of the U of I to addressing the global challenge of ensuring that all people at all times have access to sufficient, safe, and nutritious food. For questions about Vilsack’s visit to U of I, contact aces-oip@illinois.edu or 217-244-2295. For more information on International Food Security at Illinois, visit: http://intlprograms.aces.illinois.edu/food-security.